This little device goes on your LI4 pressure point (right between your thumb and index finger) to help improve your qi (energy) flow. Acupressure can help soothe aches and tensions around the body. Dimensions: 1.75" x 0.75" x 0.75"
This little Acupressure tension relief really works. Glad I sent for one. I have been using accupressure massage for years. I was delighted to find that Aculief really works for sinus headaches. I am very happy with the aculief wearable. I do a lot of knitting and was experiencing tremendous pain in my thumb joint. With the Aculief I can knit away and the pain is greatly reduced and it even feels much better when I take it off! Thanks so much for this easy fix! Using this all-natural acupressure pain relief wearable can help restore the flow of your qi (or energy). 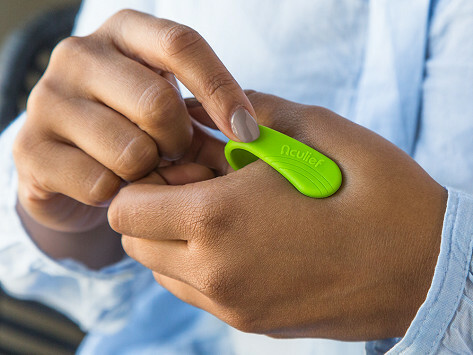 By applying pressure to your LI4 (it’s that little bulge between your thumb and index fingers), Aculief can help soothe pains and aches around your body. Squeezing your LI4 has been shown to help relieve pain, as well as joint and muscle aches, around the body. When we tried it out, we could feel some relief after one to three minutes. Acupressure is inspired by acupuncture practices in Traditional Chinese Medicine, where pain is the result of interrupted qi (pronounced “chi”) or energy flow. To restore this flow, they target certain areas or pressure points in the body. Keep this little device handy in your pocket or purse for any last minute aches relief and qi repairs.